A powerful sonic weapon for evening out wonky mixes and recordings, but one that needs to be wielded responsibly. Brightens up dull recordings. Evens out boxy and resonant recordings. Internal Bias allows targeted processing. Resolution control is effective. Easy to overdo in isolation. Not a substitute for your ears! Can easily take away character. 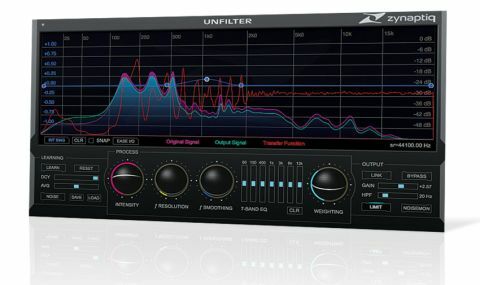 Zynaptiq's latest plugin, Unfilter, offers a very straightforward proposition: it takes a sound, assesses what it's been subjected to in the way of filtering or other resonances, be they artificial or room induced, and applies processing to remedy it. It sounds like snake oil, but could this in fact be a genuine sonic elixir? At the heart of Unfilter (VST/AU/RTAS/AAX) is a process called 'real-time blind de-convolution', and as with many restoration tools, it starts with the software analysing the input signal. Unlike some others, though, it throws up the results as it reads the frequency response. To begin with, the curve modulates, but gradually it settles down, at which point you can turn the learn function off. "Once you have the estimated curve, you can apply the processing to the whole spectrum or a part of it"
Once you have the estimated curve, you can apply the processing to the whole spectrum or a part of it, removing or counter-balancing the effects of resonances, roll-offs and comb filtering. As well as the corrective filter curve, Unfilter also incorporates a freeform EQ with variable curve interpolation, a seven-band graphic EQ and a 96dB/octave high-pass filter. The Learn process can be refined in various ways. For example, Noise mode will ignore musical features such as drones that may be interpreted as resonances, and the Decay control tells the processor to focus on more recent analysis data (although optimum results seem to be achieved with this set to maximum, with everything remembered and assimilated). The resultant transfer curve clearly shows the peaks and troughs of the source and can be saved for comparison to another with different Learn settings or applied to a different sound. Moving into the Process section, the default setting is a basic starting point from which you can contour the correction. The Intensity control is centre-nulled, turning up to increase the Unfilter correction or down to exaggerate the detected filter curve. The Resolution control either restricts the correction to just resonant peaks and troughs, or includes filter correction, enabling dull recordings to be restored with a clear and airy top end. The Smoothing control counters any ringing that occurs as a result of the narrow-band ups and downs of the learnt curve, and Weighting restores the bottom and top end that can get lost in the Unfilter process. Very importantly, you can restrict the correction to just a portion of the learnt curve and get rid of specific resonances with the Internal Bias mode. "Trying it out on a poor field recording of a band rehearsal resulted in a staggeringly presentable demo"
There's clearly some very clever and inventive processing going on with Unfilter, and trying it out on a poor stereo field recording of a band rehearsal in a clattery room resulted in a staggeringly presentable demo. Likewise, the results on a vocal recorded in a boxy room were a dry and even signal that sat straight into the mix. It also proved useful on an upright bass recording with an uneven response. It really does 'undo' dodgy frequency anomalies. As such, then, Unfilter is an astounding restoration tool. But despite its often magical results, on a sound or mix that's already pretty good, it's no substitute for a pair of ears and some deft EQ and compression. Where it shines, then, is as a super-convenient tool for bringing life back to poor recordings, saving a lot of time that would otherwise be spent finding problem resonances manually.